Deep Thought was developed by Malaysian Aizat Faiz, with the purpose of asking thought-provoking questions that will eventually make you more introspective and thoughtful. With social media helping to widely spread the thoughts that come from our own brains, our generation is often accused of being shallow and unthinking. But we do have deep thoughts; they are just not often expressed on social media. So maybe all it really takes is a platform that asks the right questions? Deep Thought was developed by one Malaysian, Aizat Faiz, and it works by asking you thought-provoking questions that are meant to make you more introspective, and in turn, gradually impact you in real life. 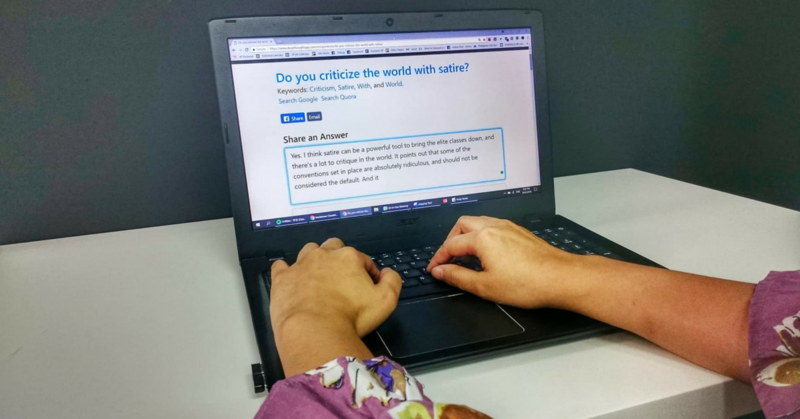 It’ll ask you questions such as “Do you have life figured out?”, “What social needs should you not expect your past partner to satisfy?” “Do you criticise the world with satire?” and “Is your self-worth tied to your body’s physical appearance?”, among others. Such a personal app was similarly developed for personal reasons. “The original goal for Deep Thought was a place for me to collect my thoughts in a systematic manner after experiencing burn out, a career, and an identity crisis,” said Aizat, in a post that is pretty relatable to many of us living in this concrete jungle. “So even if no one else uses it, I will still be better because of it, and I have,” he said. He started the project when he was at a low point in his life. Aizat was a former employee for Facebook, but was unwilling to do anything with his life, and wanted to understand why. So he started asking himself: “Should I leave Facebook, or should I stay?”, “Should I fight, or fly?”. He turned these questions into a list, and later a spreadsheet. “Then the engineer in me asked: How do I scale this? So the site was born,” said Aizat. He wanted to open the door for others to understand these aspects about themselves as well. You’re allowed to be as brief, or as lengthy as you’d like, and your answers are shared for others to read and ponder on in the platform itself. Signing up is just linking your Facebook page, and you’ll have your profile photo and name associated with the questions answered, and be able to see what others answered as well. You can post responses to other thoughts, or ask them more questions. It’s like group therapy, if you think about it, but without the obligation, commitment or cost. Even attempting to measure its impact leaves Aizat, well, thoughtful. “I can look at ‘engagement’ perhaps. Engagement would mean more answers shared per person. It would mean more people interacting with each other. The standard engagement metrics. But I’m nowhere there yet,” admitted Aizat. “Have I fulfilled impact yet? Not at all, but honestly I haven’t tried enough,” said Aizat. Getting people on without a substantial marketing budget can be a challenge as well. “I would love to [monetise]. I would love for this to be a sustainable business for me. But I don’t know how yet. Ads? They leave a bitter taste in my mouth. Physical products? Possibly,” said Aizat. The questions aren’t exactly “shareworthy” either. “I honestly don’t know how to work around these. I think it might have to be a chicken and egg problem,” said Aizat. He hopes that with the right content and connecting with the right people will help someone want to contribute. Wanting to see what personal impact I’d get, I gave it a shot. I logged onto the platform plenty of times to gauge my own thoughts. But just like Aizat predicted, often, I find myself clicking that X button after I’ve typed out paragraph upon paragraph of answers for a question, simply because I wasn’t willing to let anyone else see it. I had almost a month on the platform, just surfing around, but could only type out and submit 2 answers in the end. 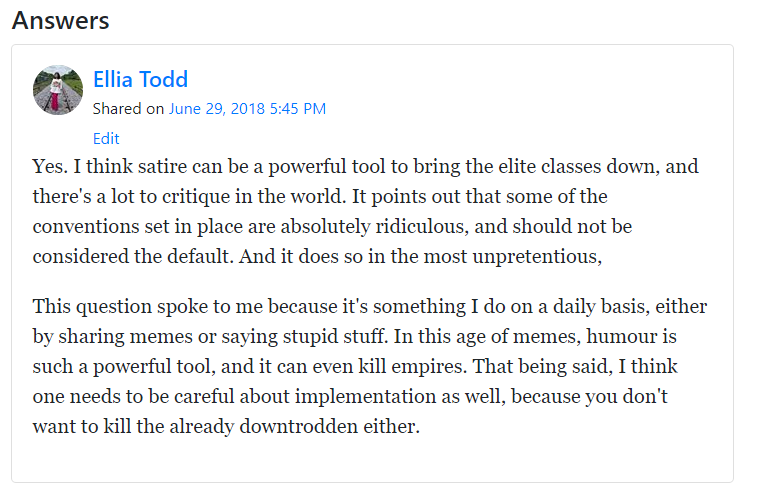 My answer to: Do you criticise the world with satire? But somehow, the process itself can be a therapeutic one. We’re too often focused on the outward: how we look, how we present ourselves to others and how we can turn our ideas into reality. It’s nice to have a platform for you to look inwards on yourself, and analyse: why do you think the way that you do? In some of these instances, I was surprised by the answers that came out of my own fingers. I don’t know if I’ve become more thoughtful—after all, once I’ve typed my paragraphs, I close the browser and go back to being the same old person I always was, loud and annoyed with the world. But perhaps with long-term use, I’ll slowly grow a better grasp of myself, and perhaps save on the therapy bills that would otherwise be a definite part of my future? Now that’s a question for Deep Thought. You can find out if you have a Deep Thought on their website here.